This is a strong and promising first outing by Andy Diggle, but not without its faults. The pacing feels a little quick (probably due to the one-shot packaging), and there are a couple of rough spots in the story that stand out to me. The issue does manage to do what it’s supposed to do though, and that is give us a better sense of the new status quo, and provide proper motivation for Osborn to want to put Daredevil on his infamous list. It also reveals several new plot points that will provide plenty of creative fodder for upcoming stories. 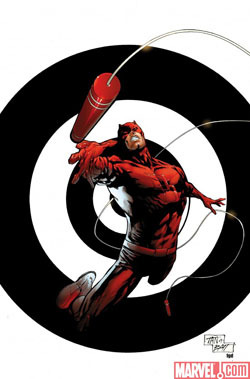 Wanting to do more to Daredevil than just kill him, Bullseye decides to take their fight to a larger stage where their actions are guaranteed to affect more than just the two of them, and these events. which I won’t go into here, have a profound effect on the title character. The art, by Billy Tan, is quite competent (not counting the panel where Matt looks like Beavis – or is it Butthead? – from Beavis and Butthead), but doesn’t quite suit a Daredevil comic, and probably adds to this particular issue feeling just a little too much like standard superhero fare. The preview pages from Daredevil #501, however, look absolutely stunning and just right for the book. Great choice picking Roberto de la Torre for the job, and it’s great to see Matt Hollingsworth still providing the colors for the ongoing series. But it’s not just the art that looks more appropriate, it’s also a joy to see that Diggle’s writing feels more solid too. While Dark Reign – The List: Daredevil was a good enough issue, Daredevil #501 looks vastly more promising. I can’t wait to check it out! I love villains that are the right balance between comic and threatening. I think the best example was Robert Shaw in The Sting. Agreed on this one. Tan’s art is the biggest detriment, not out of quality, but due to not fitting Daredevil or its story, which hasn’t been a “super hero” book in years. Just too bright and colourful compared to Lark or the upcoming de la Torre and other artists since it relaunched with marvel Knights. #501 does look fantastic though and is a big draw for me. Another problem stems from the book being featured as a preview in two seperate books already. Having 8 or more pages already available, and the best pages from the book imo, as they deal mostly with Matt’s new status quo, really made the book feel short and weak as I kind of glossed over the “old” content I’d already seen in previous books (DD 500 and The List-Avengers). Not technically this issue’s fault, but still probably impacted the way I felt about the issue going in. PS: Captcha for comments is the devil!